Did you know the expression "it's a dog's life" was first recorded over 500 years ago? As you would imagine, it referred to dogs' lives at that time, which really weren't very good at all. So it meant a rough life. But our dogs' lives, well let's just say that things have improved in 500 years. When we lived in Colorado we rescued each of them, many years ago now, so they certainly went from a dog's life to a better life. And years later, even though we literally picked them up and moved them all around the western hemisphere, they have adapted wonderfully. We took them from cold country to the tropics and the only suffering they had to endure is probably an extra haircut here and there. We took them from the mountains to the beaches and the islands. So yes, we turned their world a bit upside down, but they don't seem any worse for the wear. 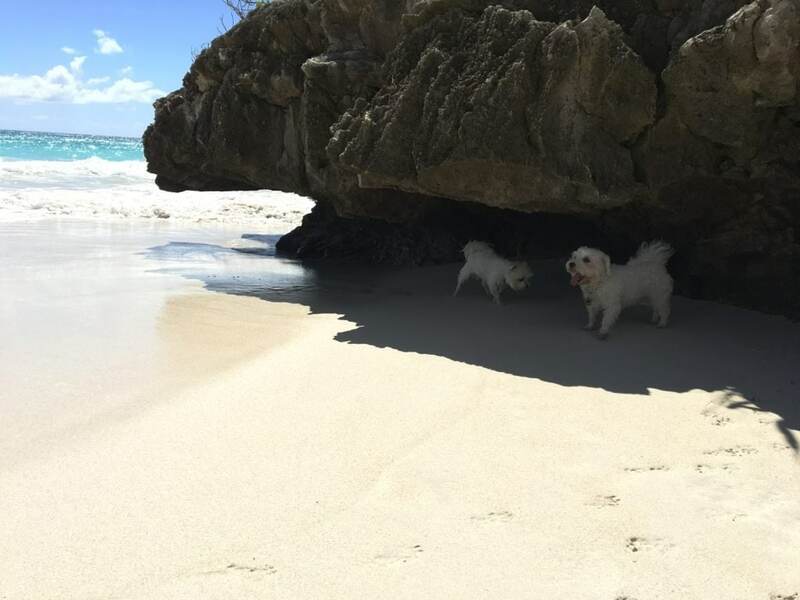 In fact, they are happy, happy pups! 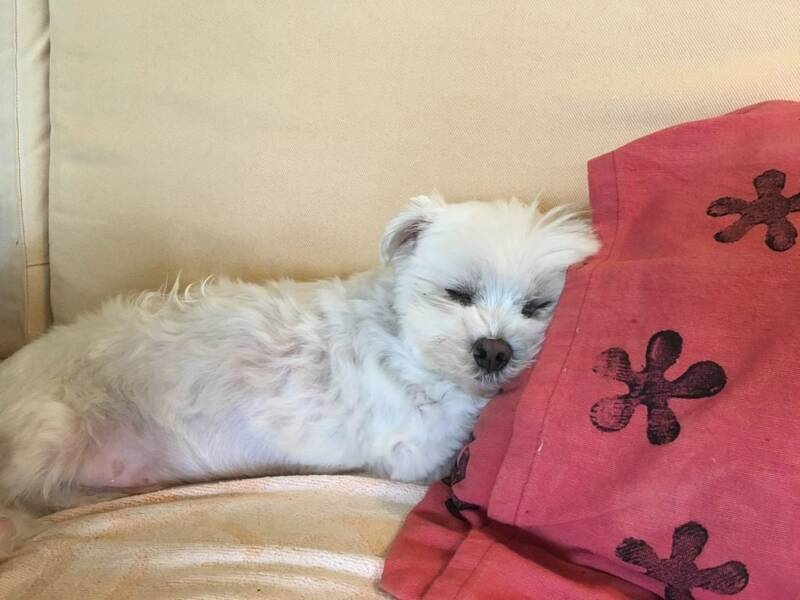 As a reminder, the first one we got is named Kirby; he's a handsome little Maltese, and a good example of the breed. 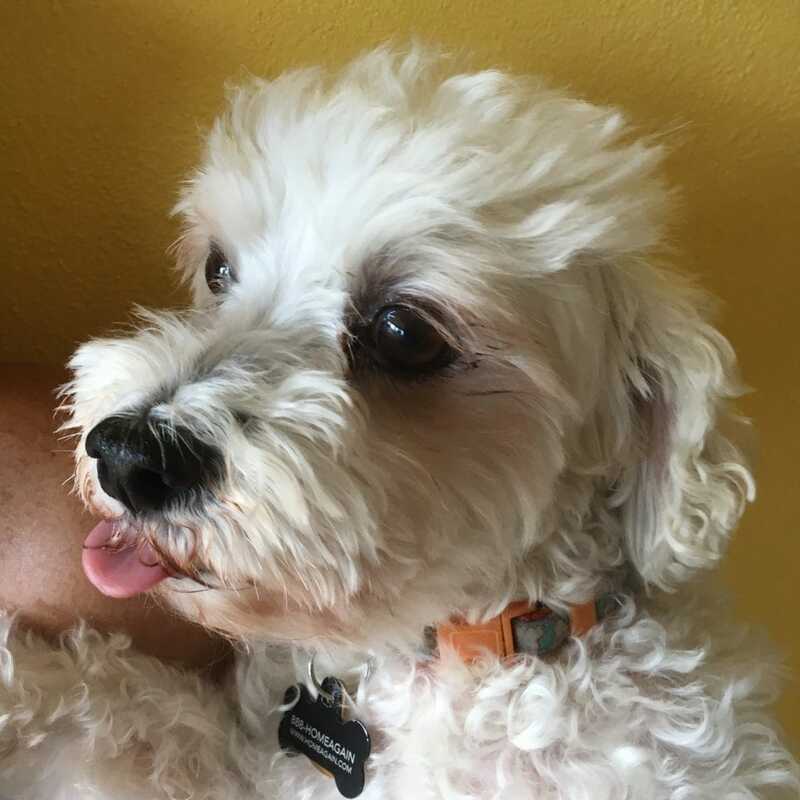 He has a bit of a Napoleon complex, and can be a little snippy when someone first approaches him. He's also very quiet. 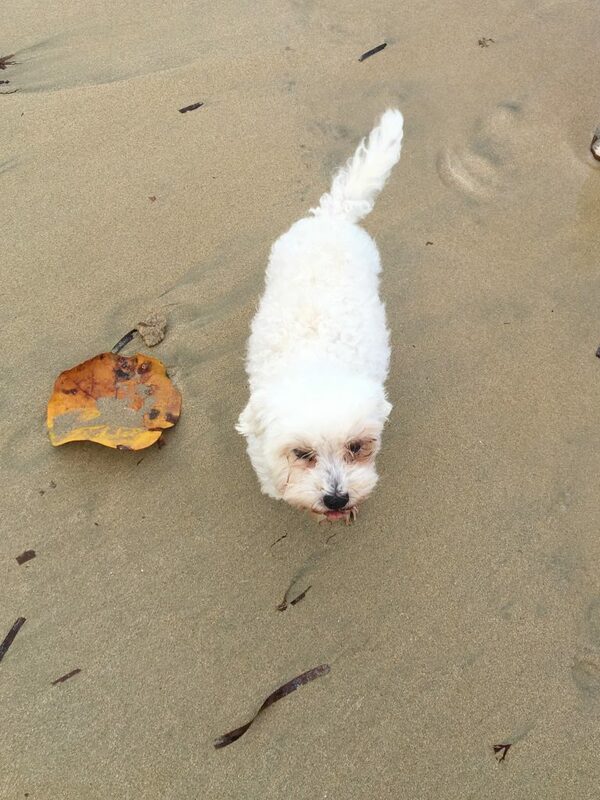 Then there's Maxwell, another Maltese (but not a great example of the breed - too curly!). He's the more nervous one and makes enough noise for both of them (in his defense, he spent the first 2 years of his life in a cage). And he only really makes noise during transitions, like getting in the car or getting off an airplane. 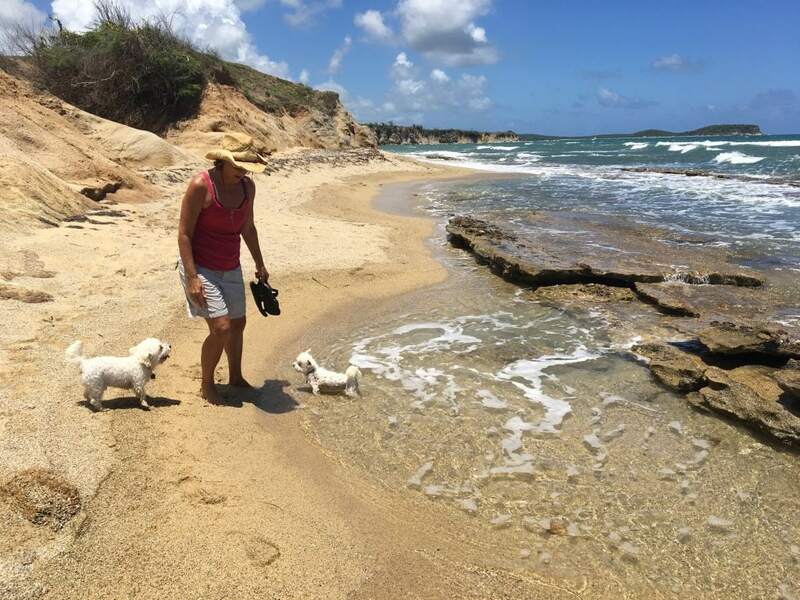 These little guys are over 10 years old and because of that, we'd planned to bring them to Vieques where they'd spend the rest of their days in a peaceful Caribbean doggie retirement. We were hoping to do some travel without them, leaving them with friends here on the island while we went off with the "lightness of being" you get when you pack light. Well we all know plans have a way of changing and so now, since retirement, these dogs have been on 13 separate flights, with some of them of the international variety. Are all zee papers in order? When we went to Colorado for the big wedding, we just couldn't leave them behind. It was hurricane season and we'd heard horror stories from friends about the previous year. 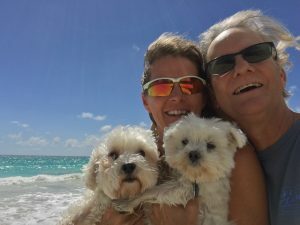 People left their dogs behind while they went to the States (not fleeing the hurricane, just going on vacation before they knew the hurricane was coming). Then the disaster struck and they were unable to return. Their pets were in a strange situation for an extended period and the friends caring for them had an extra burden they really didn't need at the time. There's an expression about how you have to learn from others' mistakes because there's not enough time to make them all yourself. So we learned from that and off we went, all together. It's not torture to travel with them BTW, but if there's any hitch in the travel it can get bad. 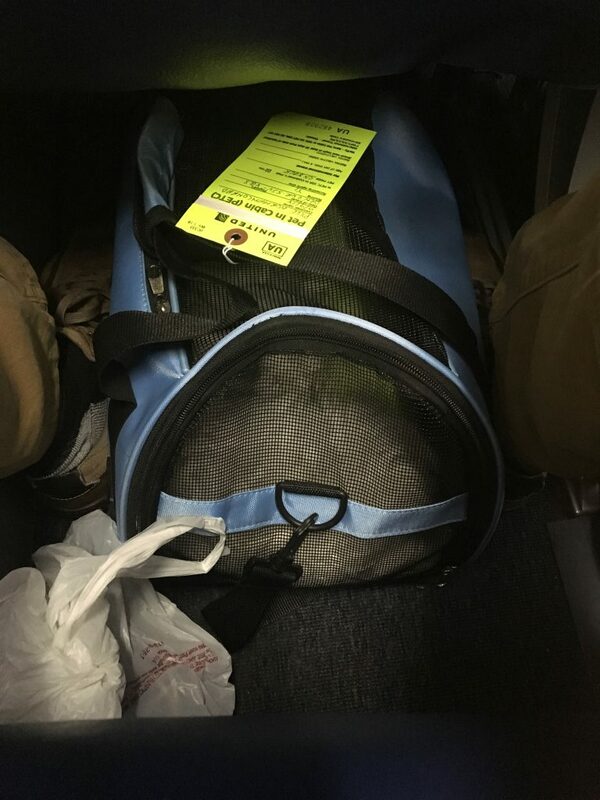 We would have to find another flight with "openings" for in-cabin pets - the limit is usually four total, and we have two. It's just an extra stressor. When we fly, they go under our seats in the cabin, counting as a personal bag for each of us. Kirby is the quiet little church mouse who just curls up and goes to sleep. Maxwell usually whimpers himself to sleep in a steady drone. It's peaceful, he's just soothing himself, and other passengers can't hear it because of the airplane noise. When the airplane lands though, it's a different story. Once the engines shut down and everyone starts getting their luggage Maxwell gets agitated and starts barking. He wants to get out now!!! That's when the other passengers discover we had him there all along, saying "I didn't know there was a dog onboard!". Then we pull out Kirby and they say, "Oh, there's two of them!". Maxwell's announcement was prolonged when we returned to San Juan from Denver via Newark. We'd been on that plane for 5 1/2 hours, 1 1/2 of them sitting on the tarmac in Newark while they fixed the A/C. So he was really ready to get off that plane and out of that travel bag! Our home is a simple, solid concrete house with a fenced yard. Between the yard and the deck out back, the doggies spend a fair amount of time outside. There, they hang out with the chickens, as the parade comes through each day. 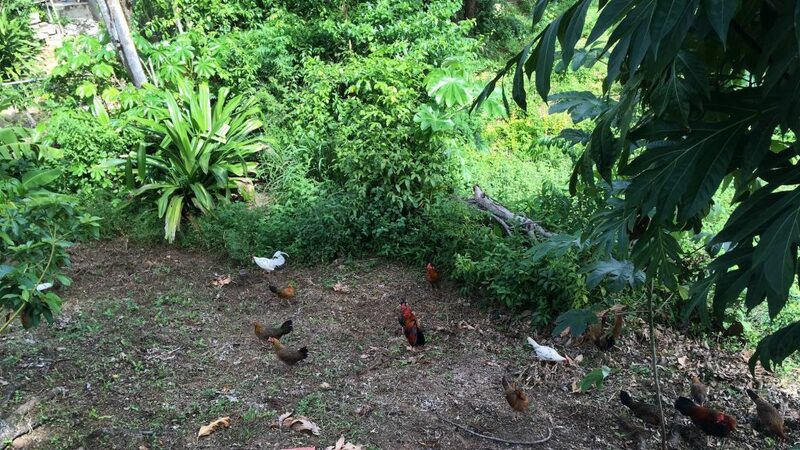 We can easily have 20 chickens in our yard at any one time, just cruising through looking for bugs, worms, and seeds, and showing the little ones how it's done. The dogs actually ignore them about 95% of the time. I don't think they really know what to think of these noisy, colorful creatures that walk on two legs. So they just go about doing their dog thing, patrolling the property, and Kirby forages for food. His greatest prize is a cherry tomato (we had volunteers here when we moved in). When he finds one, he'll bring it up on the deck to show it to us and enjoy the fruits of his labor (literally!). One day Kirby surprised a cat in the bushes and came out with a bloody ear - poor thing! Deb moved that cat along with a garden hose and we haven't seen him since, but Kirby was a little traumatized. Fortunately, he did heal up quickly. We don't get horses in our yard because we work to make sure of it. With our solar panels sitting on the ground, we don't need a thousand pound animal stumbling around them. Besides, they have been known to break PVC water pipes in order to get a drink and we don't need that hassle. But one day there was a horse in the next door neighbor's yard and Kirby was having none of it! That little six pound dog literally barked and growled that huge horse away - he left the yard! But most of the doggies time is on the couch in the living room doing what dogs do: sleeping. I'm pretty sure this is true for most dogs, they sleep about 16 hours out of every 24. 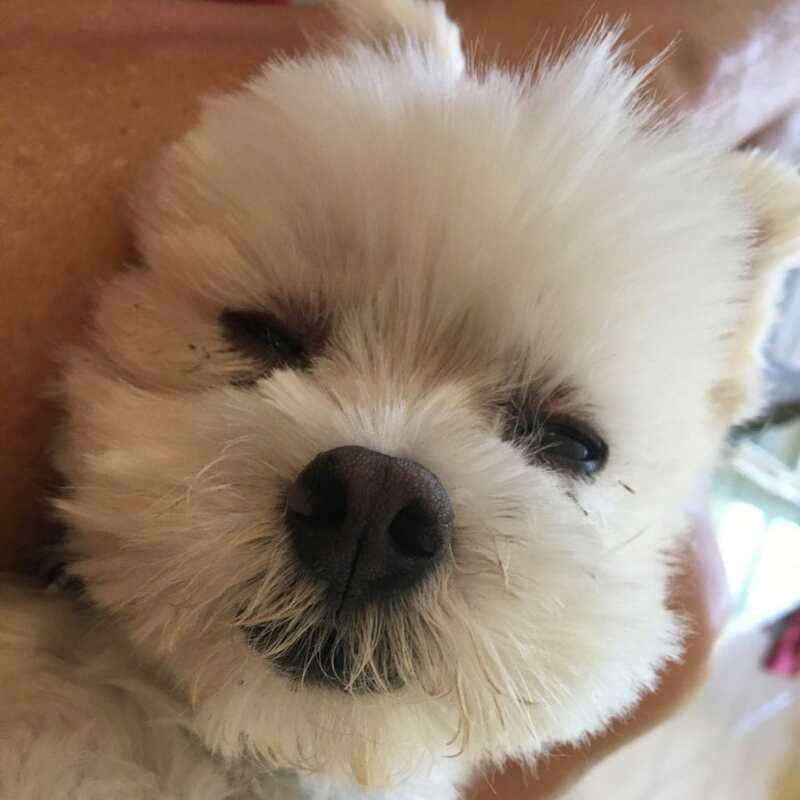 Kirby especially likes his sleep and gets slightly annoyed when we wake him up to eat, or to go to bed, ha! 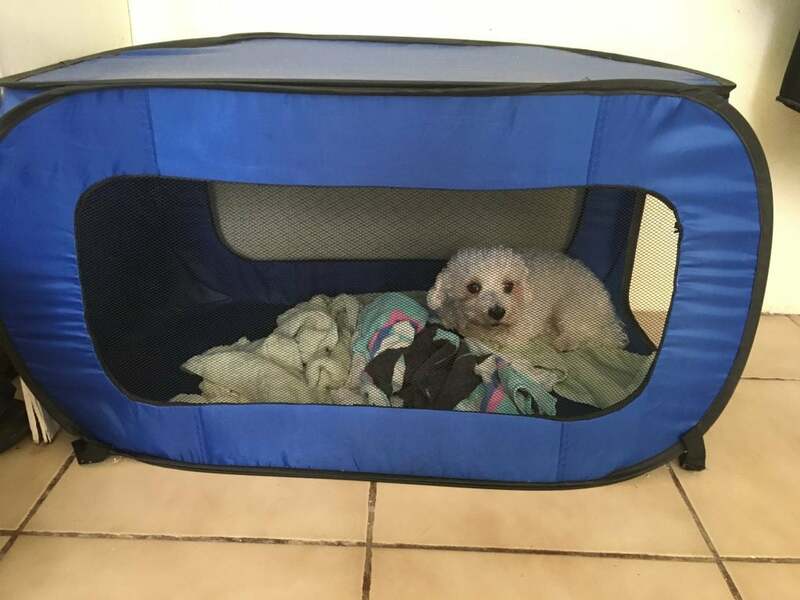 Maxwell spends a good amount of his time sleeping in his pop-up kennel in the bedroom. Even though it's a semi-permanent fixture now, this thing has been an amazing buy for our adventures! 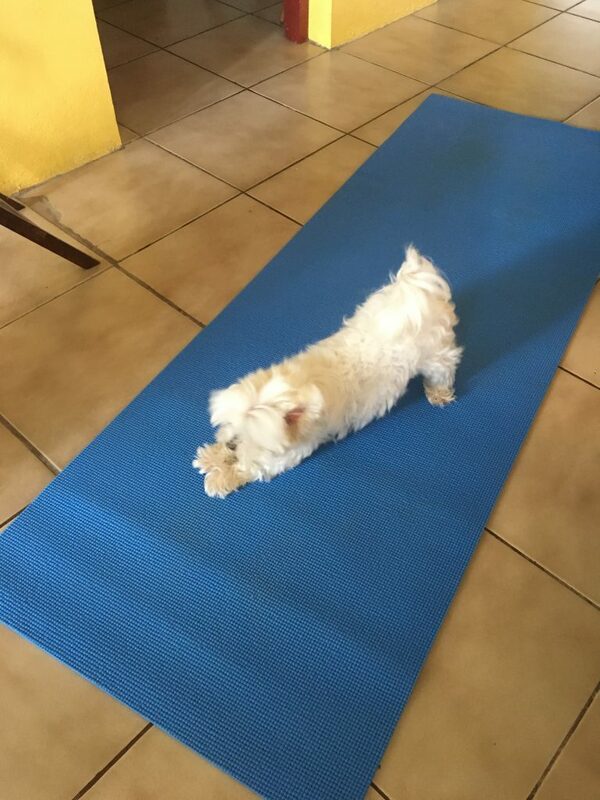 It was inexpensive, folds down easily, and works beautifully. We live in a middle-class Viequense neighborhood called Florída. It's actually a little unique on our street because there are very few dogs living here, and the ones that are here are very quiet. 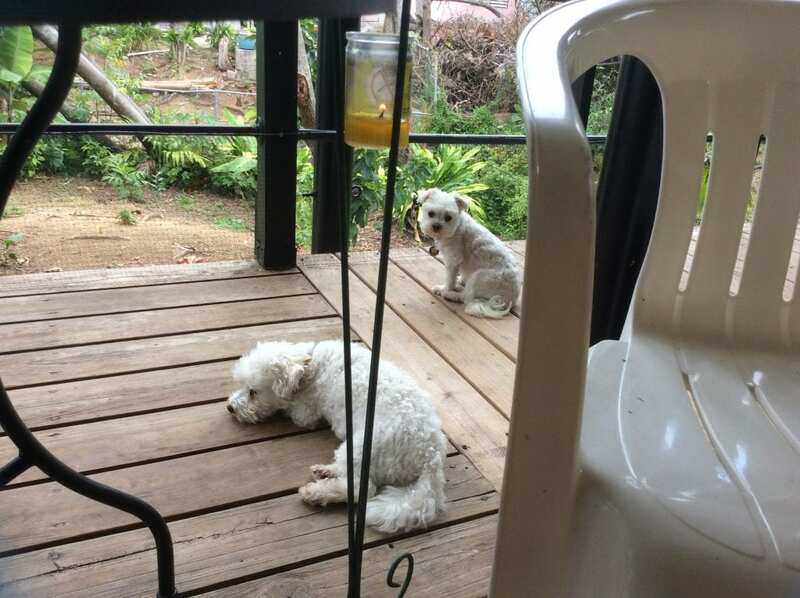 We'd read online about Puerto Ricans and their incessantly barking dogs, and on occasion we'll hear one off in the distance that won't quit for a couple of hours, but we don't get that around us at all. We love our barrio! And so do the pups when we take them for walks. There's a loop we do, avoiding a couple of streets we know that have aggressive dogs, and we almost always stop at the baseball field. It was in the process of being rebuilt when the hurricane hit and nothing's been done with it since. So it's a place for horses and dogs to play now, among the rebar and concrete blocks here and there. One day they'll fix it up and we'll get to go watch games with the doggies, a fair trade-off! 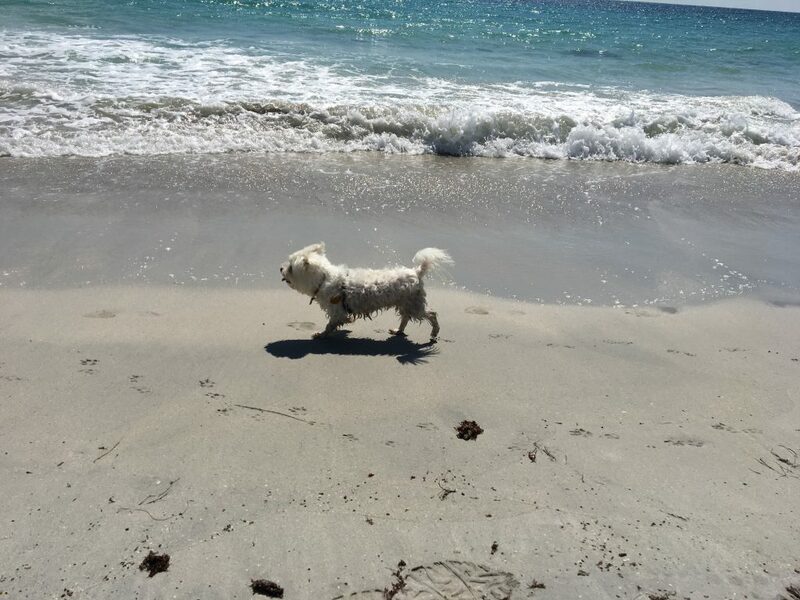 Of course, by far the best part of the doggies lives is when we take them to the beach. I guess that's true for our lives too, and the lives of many, many people! 🙂 First, to keep Maxwell from going nuts, we quietly gather their "stuff" like leashes & harnesses (depending on where we might be going), their water bottle, and a dog towel. Then Deb picks up Maxwell, whining and making all sorts of comical sounds, while we close the house and load the car. Kirby just follows along, excited but quiet. Then they get tossed into the car and the door is quickly closed while Maxwell uses his vocal chords in the way God intended. 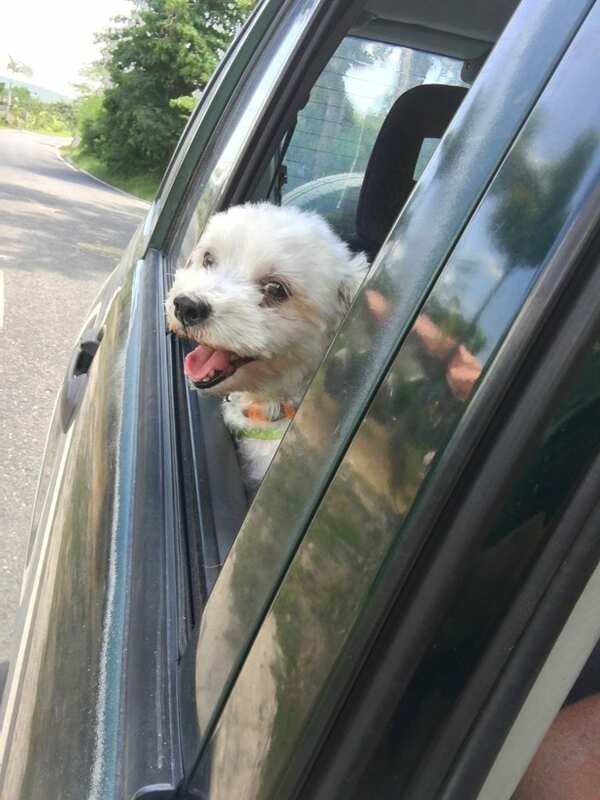 He knows he's getting his two favorite things: a car ride and a beach day - yay! And it doesn't matter if it's been over a week or if it was just yesterday, the ritual and sheer volume is the same. 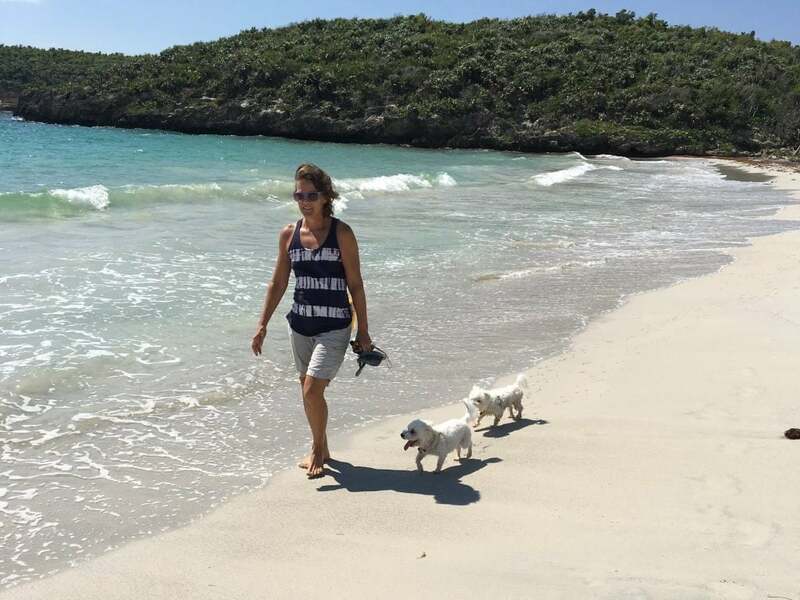 We usually take them to what we call Dog Beach, aka Ceiba Tree Beach. 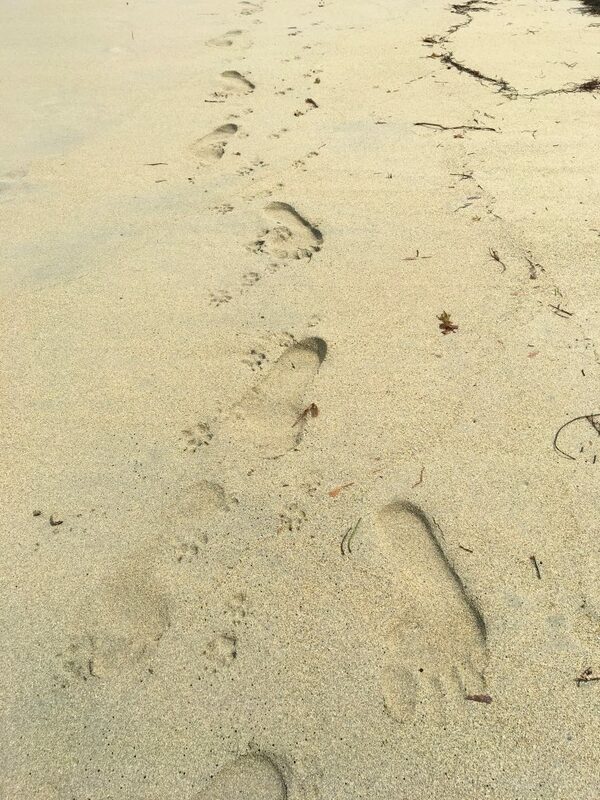 Check out these links if you haven't seen our Vieques Beach Directory. When we get there Maxwell runs ahead barking his fool head off while Kirby immediately starts exploring the dunes at the edge of the jungle. He never really finds anything of interest but he sure pees on every last thing he finds! When he gets hot, he'll come down to the water and just lay down in it. And he'll get gently pushed to and fro by the waves as he cools off. Maxwell will do this once in a while, but mostly he just likes to stand in it, no more than about dog-ankle deep. They get a drink of fresh water at the halfway point about 3/4 of a mile down the beach and we go back the way we came. We take them snorkeling as well, but less often. They hang out in their dog raft while we explore underwater. The raft has holes to allow water to flow through so they're not being parboiled by the sun. The last time we did this, we were down quite a while and when we came up they seemed a little stressed. I don't think they understood that we were right there with them, especially when we dove down and disappeared. They probably thought we'd died! We've also taken them on our paddleboard a couple of times. The first time, we didn't have their little doggy life jackets, but it was a calm day, what could go wrong? Deb took them out and they seemed to be having a good time as she paddled around. So I wanted to try. I took them out and all was well, we were having fun. They were on the front of the board as I stood up and paddled out. Then I turned the board around and was coming back toward the shore. The next thing I know Kirby fell in, and I couldn't see him! He must have gone under the board, so I jumped in to save him. The next thing I knew, Maxwell had jumped in to save himself! We were all in the water now, with me putting Kirby back on the board and Maxwell swimming to shore. Everyone on the beach thought this was great entertainment - they were laughing anyway. Ah well, we all lived to tell the tale, but we always put on their lifejackets now. Everyone needs a little healthcare from time to time, and it's the same with the Littles. 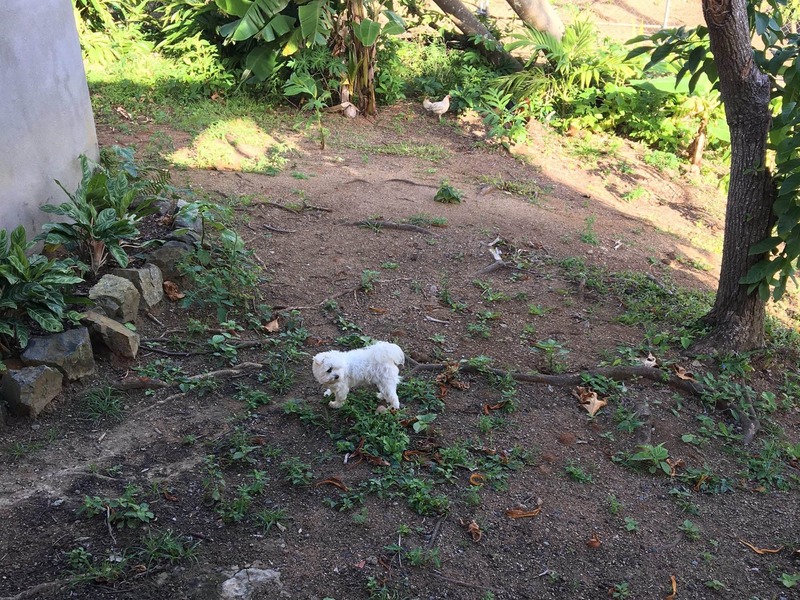 We take them to the Vieques Humane Society (where Deb volunteers training shy puppies to help them get to forever homes). Because of the increased humidity here, Kirby gets a minor ear infection from time to time and needs drops; that's about it so far but it's nice to have VHS available to us - they have a great vet and wonderful people. 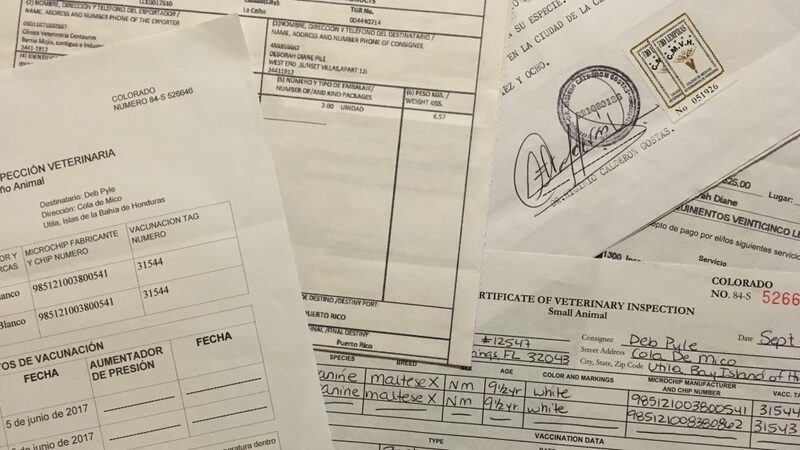 The dogs get their shots there, and if we travel (like the recent trip to Colorado) we get their health certificates there as well. VHS is such a great resource for this island and its satos and gatos! We've been a little back and forth on their food. Admittedly they haven't been consistently eating the classic high end diet they grew up with (Blue Buffalo) since we started our travels. That was one trade-off we had to make. But they sure enjoy it when we blend in a new food from whatever place we happen to be in. Now that we're more settled and have found Blue Buffalo on Amazon, we've gone back to it. It's expensive food but better nutrition may help the immune system and those pesky ear infections. And these boys are small; they each eat less than 1/2 cup of food a day, so "expensive" isn't so bad. So here we are on our little rock with our little pups. Satos. Perros. Perritos. Los Pequeños. Little dogs. Call them what you like, in any language you like. 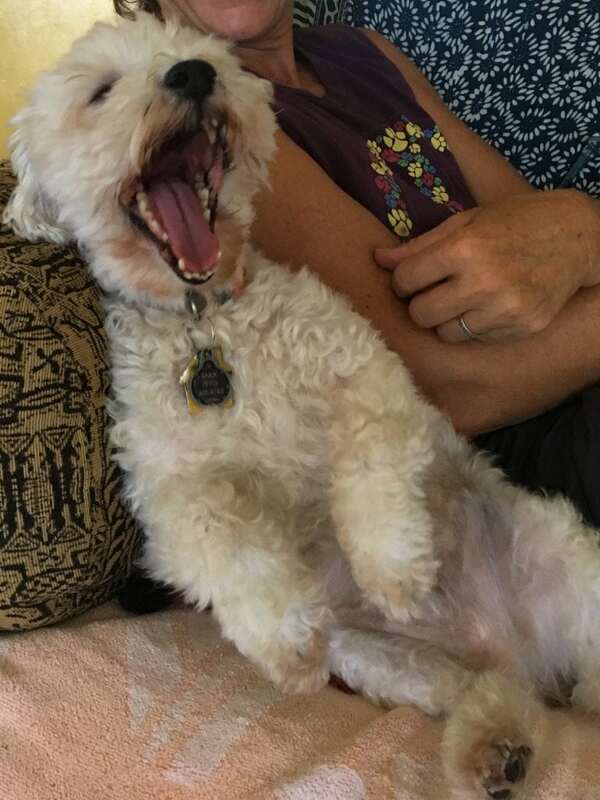 It's a dog's life, but it's a good life. 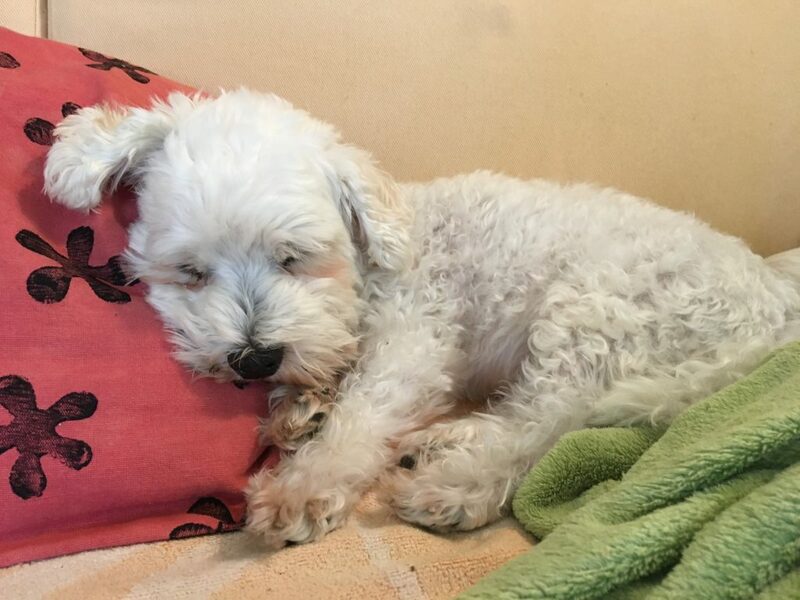 Loved this blog post about your cute pups! I would love to find one of those pop-up kennels. We just arrived on Mexico’s Yucatan coast with our 10-year old Boston Terrier and have not yet found a bed or kennel for her. She always loved having a kennel in the US as it was her safe place. I’ve got my eyes peeled for something appropriate. In the meantime, she’s doing pretty well sleeping on the sofa or bathroom rug, but I know she misses having her own safe place. 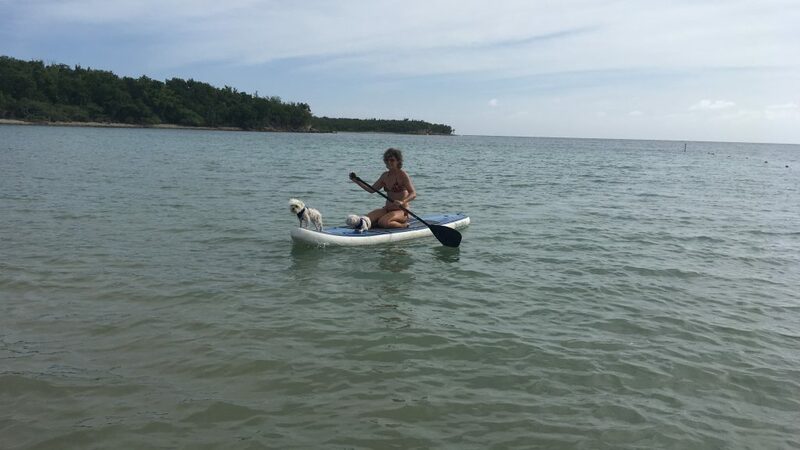 Love that your pups go paddleboarding with you! Hi! Just found your blog last week when searching for Vieques info. I LOVE IT! Thank you for sharing. 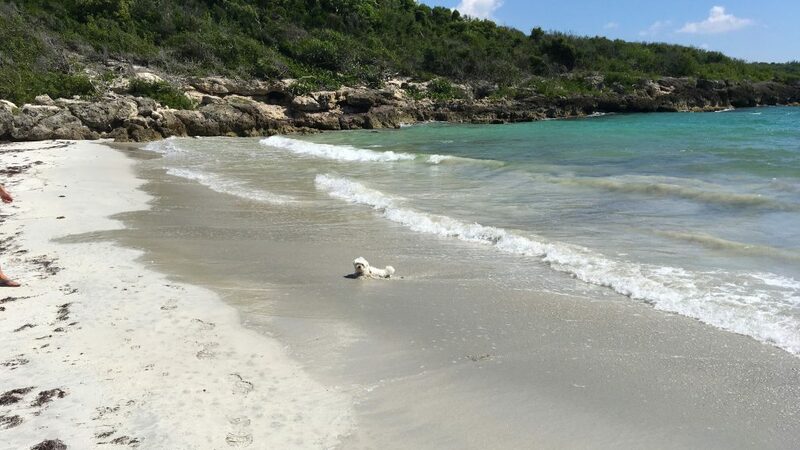 We are also thinking of early retirement on Vieques so every post is super helpful. I assumed no Amazon deliveries to the island but maybe that’s incorrect? Do some places allow delivery there? Keep the posts coming and thanks again! For everyone’s benefit: Amazon delivers to the island but there are exceptions. Sometimes it’s hazardous things like batteries, etc. Sometimes it’s heavy or very large things (Stand Up Paddleboards) that they just don’t want to ship onesie-twosie like that. And sometime it just makes no sense. Zero, nada, zilch. How about Sun Bum sunscreen to a tropical island? Nope! And don’t ask why! But I would say they deliver 90% of the things we want, including some foods that are hard to find here.